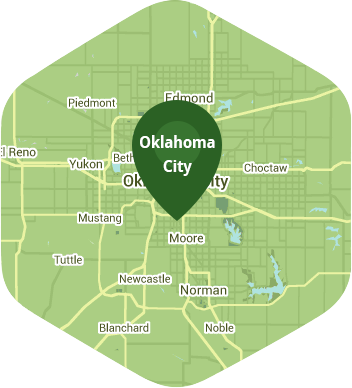 Book a skilled lawn pro in Moore. Backed by a total satisfaction guarantee and amazing customer support. Forgive the poor pun, but as most Oklahomans know, living in the city of Moore means having…more. Here you get more neighbors, more friends, and more reasons to step out of your home. The community might be small, but it has plenty of great things for you to do. During your spare time you can indulge yourself in the dinner theater, go shopping, visit one of the parks, or enjoy some luxurious movie viewing. With so many awesome attractions why are you spending your precious free time behind your lawn mower? Lawn Love wants to take lawn mowing off of your chores list, and with our lawn mowing service we are going to allow you to truly enjoy your weekend. You won't have to do any work because our independent lawn technicians will be doing all the hard work for you. You can put your lawn mower away and leave everything to us. With convenient online booking, scheduling and managing our lawn mowing service will be quick, easy, and simple. With just a few taps on your phone or clicks of your mouse, you can schedule your appointments even when you're on the go. Get in touch with us at 405-926-8318, or ask for a quick online quote because we'd be happy to hear from you. Rated 4.75 / 5 stars in 3,720 Moore customer reviews. There won't be any rain in Moore today, which means you'll probably have to water your lawn. Dusk and dawn are the best times to water your lawn (the sun will rise at 6:46 AM and set at 8:10 PM today in Moore). Here are some average lawn care prices for homes in Moore. Average lawn size 4,345 sq. ft.